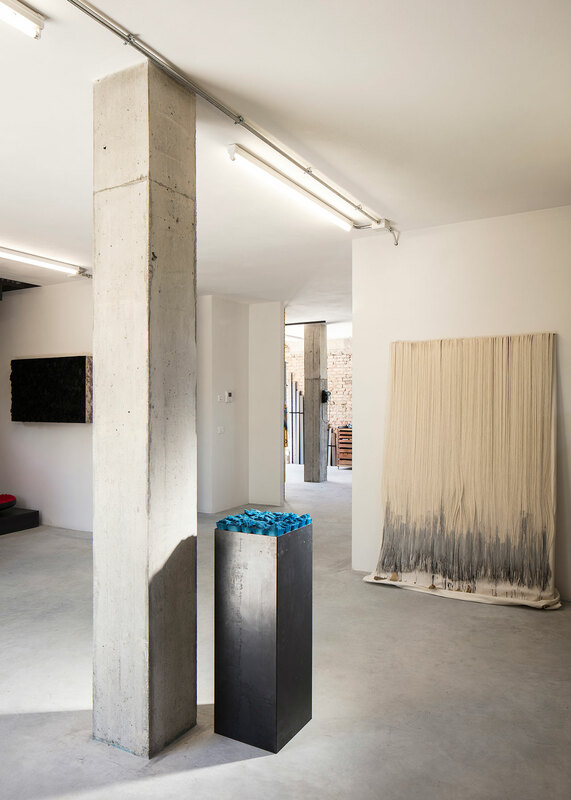 Although Italian artist Francesca Pasquali works with all sorts of dispensable, mass produced materials, from cobweb dusters and plastic cups to elastic bands and plastic straws, her work has an organic quality often resembling natural formations, so choosing the rolling hills of the Emilia countryside outside Bologna for the location of her new studio makes perfect sense. 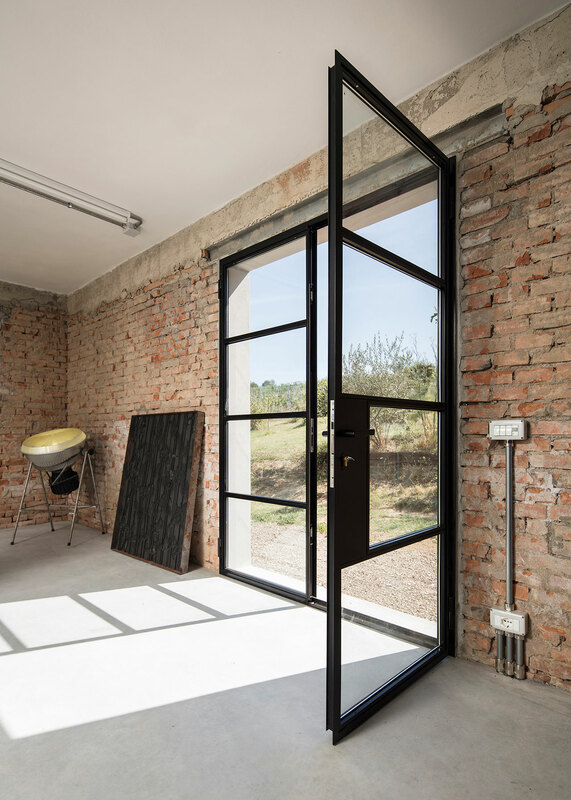 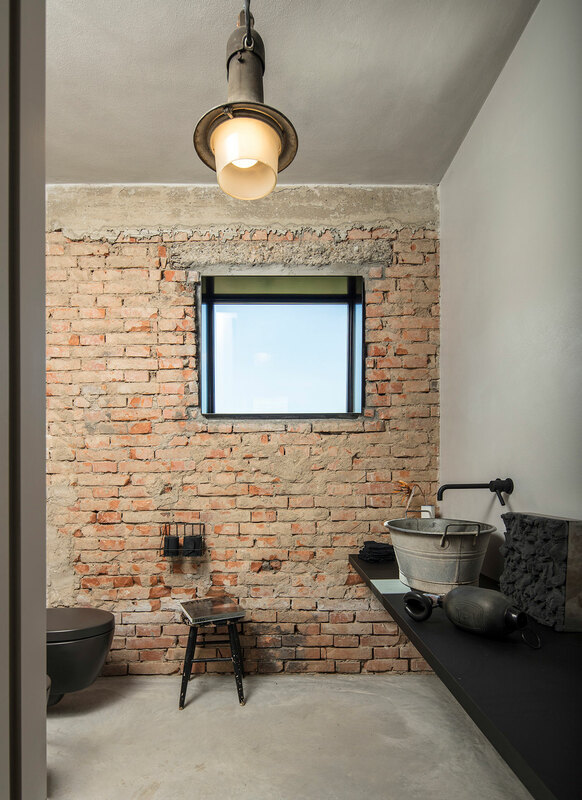 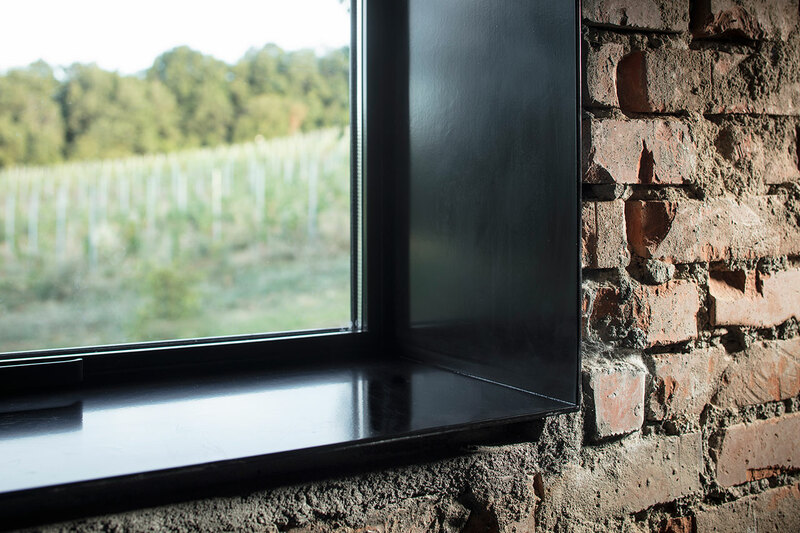 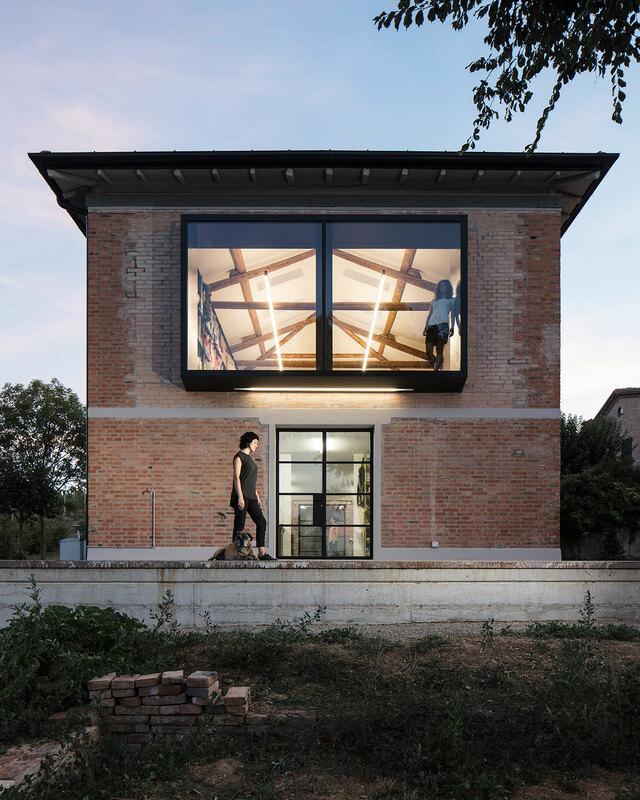 Occupying a 1960s barn, renovated by Bologna practice Ciclostile Architettura, the artist’s studio is both a place of seclusion and sobriety where creativity can flourish undisturbed and a place of communion with the surrounding nature where inspiration can be nurtured. 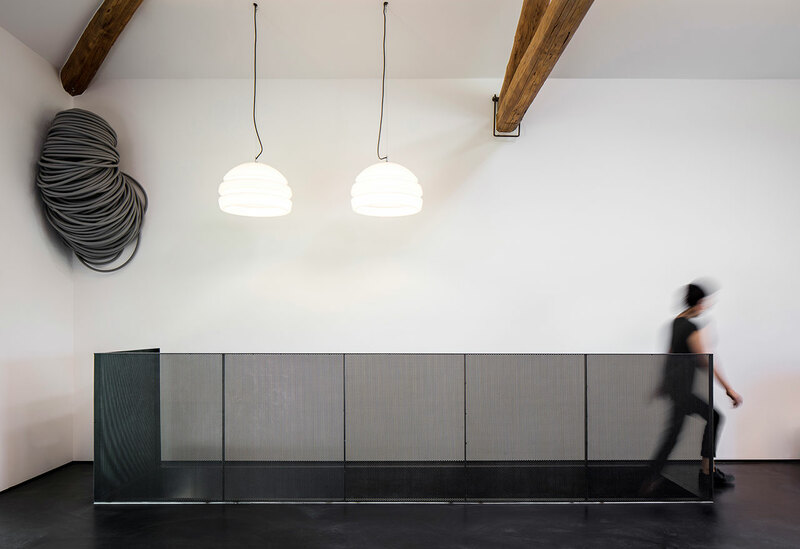 Pasquali creates large-scale sculptures and installations so it was imperative for the architects to design a spacious, bright and well ventilated area where the artist can work in. 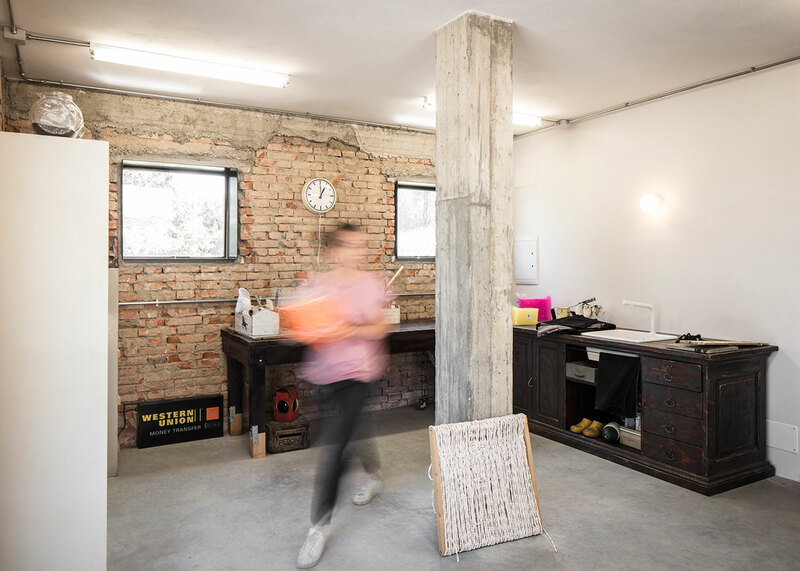 To accommodate this brief, all the amenities and auxiliary spaces have been relegated to the ground floor allowing while a new floor has been erected above to house a large working studio. 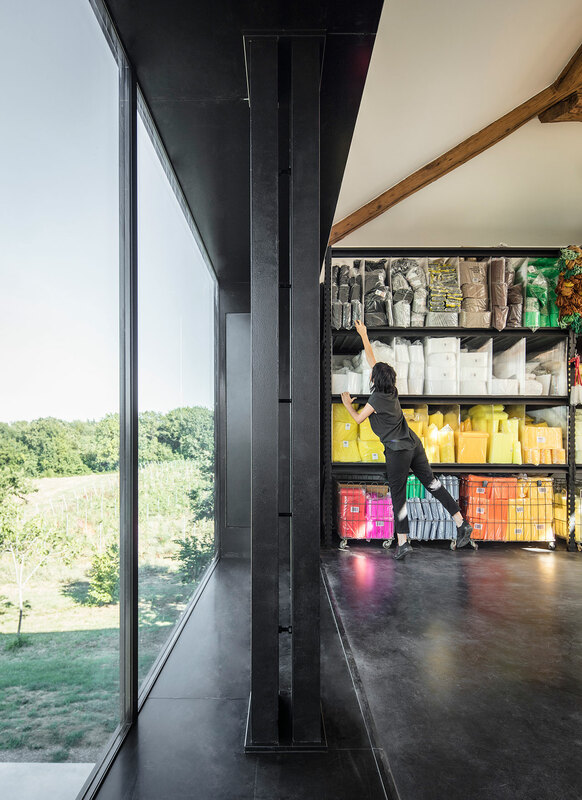 Allowing abundant daylight in through skylights and two large windows, the artist's studio is a tall, ergonomic space rendered in a neutral, black and white palette: white for the walls and pitched ceiling, which increases the light diffusion, and black for the floor as well as the workbenches, shelving storage units, window frames and stairs. 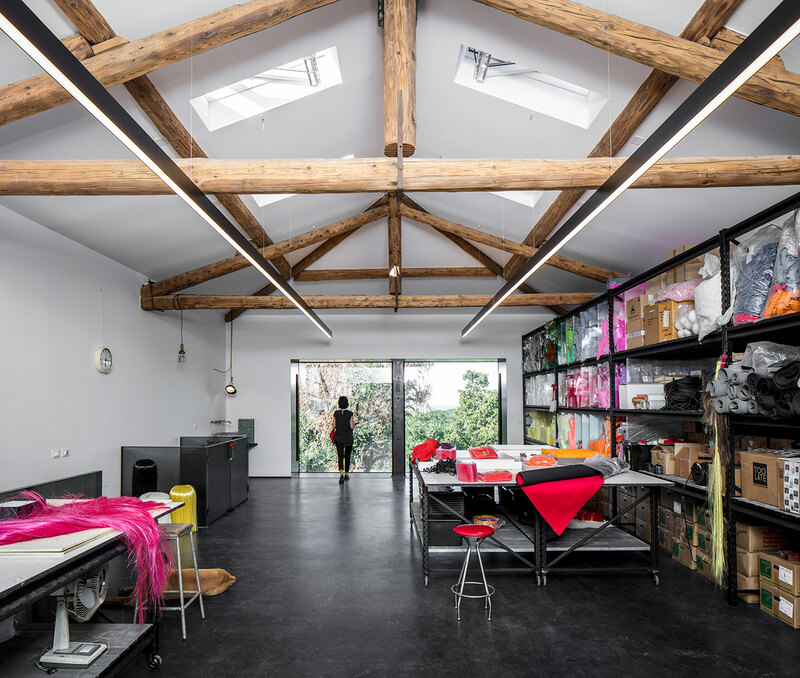 The only colourful items in the studio are the artist’s materials while the only reminder of the building’s previous use is the timber roof trusses. 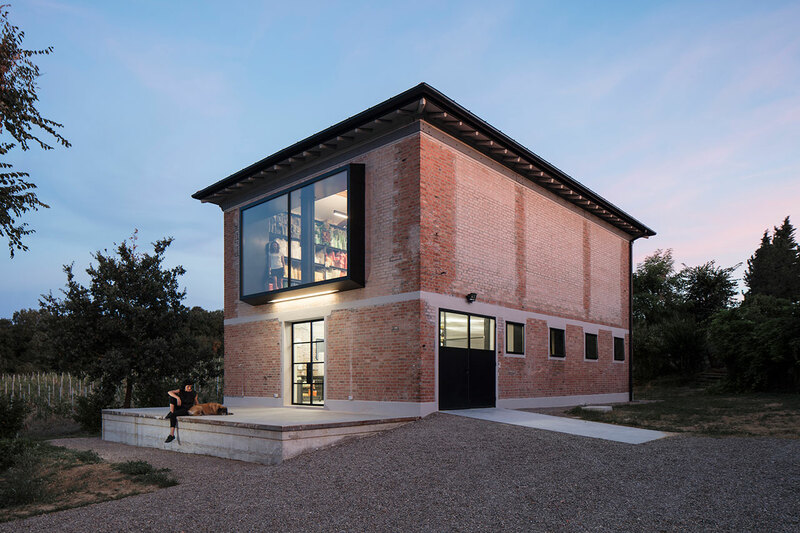 The two wide windows, strategically located on the shorter sides thus allowing the floor-to-ceiling storage facilities to run along the entire length of the space, frame generous views of the landscape, indelibly linking the space with its natural surroundings. 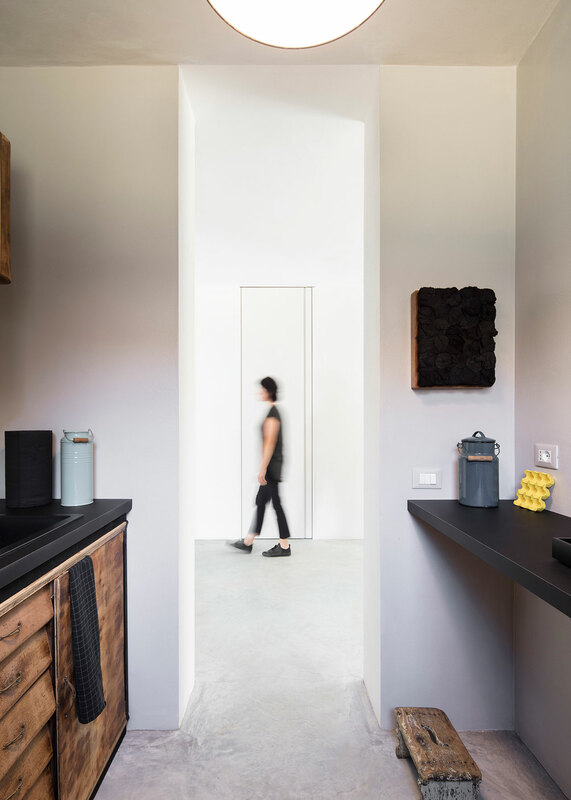 The ground floor accommodates two rooms, a laboratory and a study, which are divided by a filter zone housing the kitchen and bathroom. 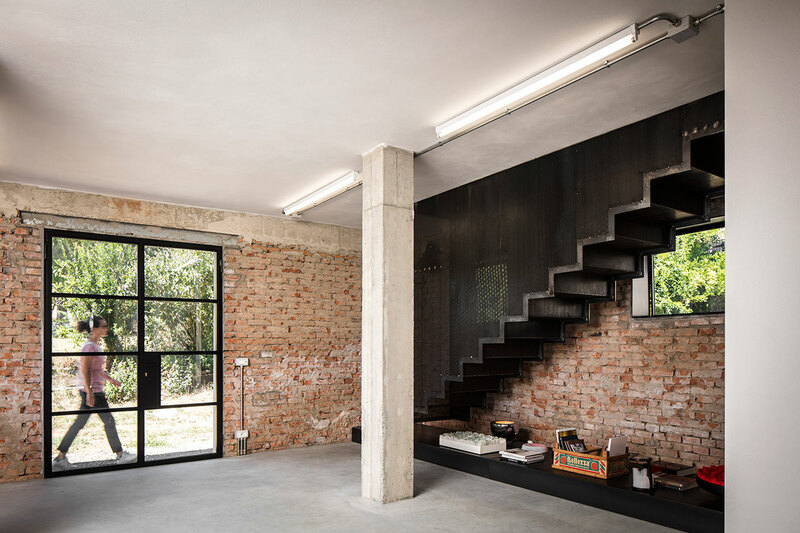 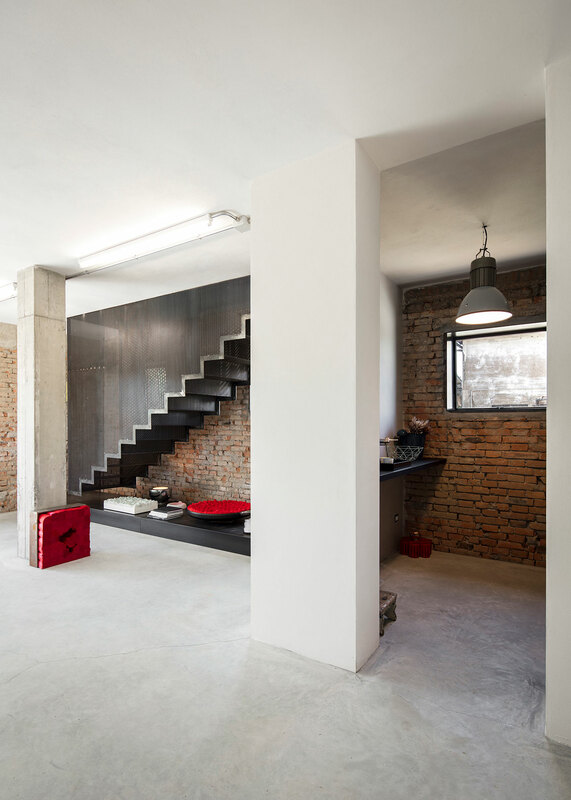 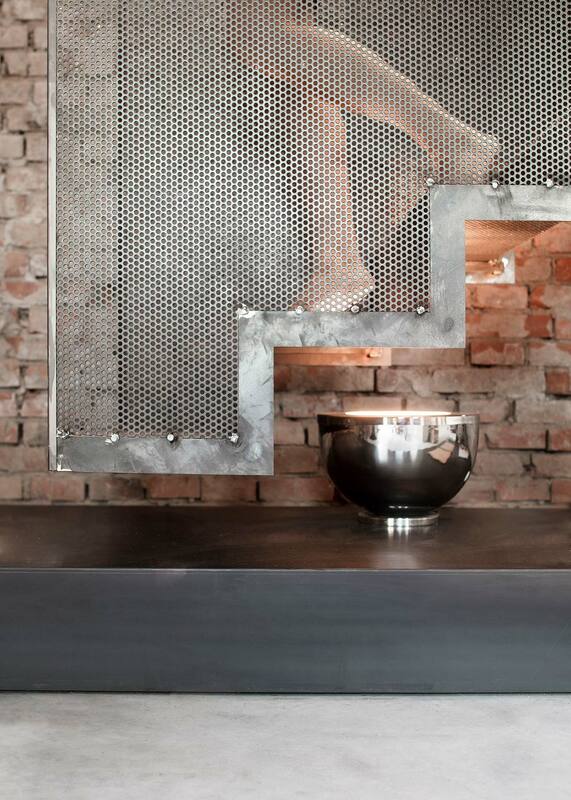 Featuring weathered brick walls, exposed concrete columns added for structural stability, and black metal accents, it has a grittier aesthetic than the larger space above yet it also has a symmetrical layout. 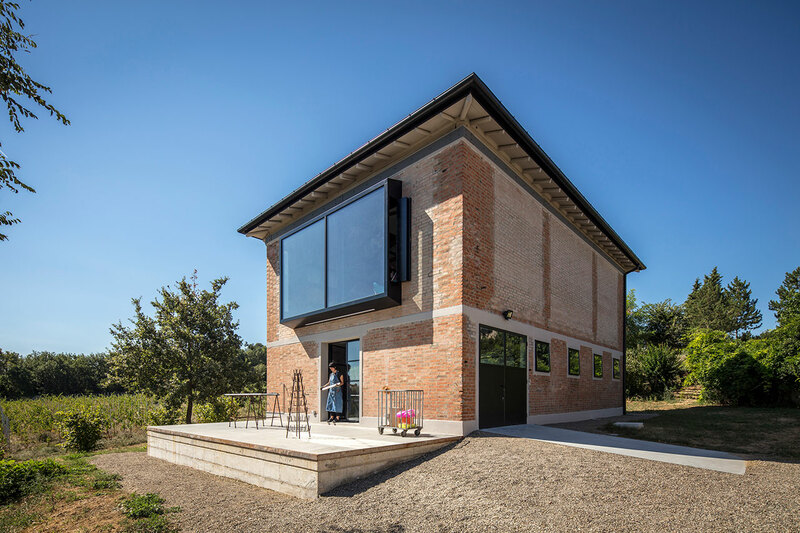 In fact, the entire building has been symmetrically designed along its longitudinal axis, which, in the middle of the Italian countryside where the studio stands, is a masterful gesture of both architectural sense and artistic sensibility.